In recent times, criminals posing as representatives of different utilities or services have robbed people’s homes. With the number of services providers that exist these days it’s highly unlikely that you can verify someone’s identity based on the company identification that they may present. In this scenario, the surest form of identification is an original national identity card or the driving license. These are routine identity documents and easily recognisable even by children as they’re common to all households. You may accept a photocopy as well if it’s legible and can help you discern if the person presenting it to you is the one in the document. The proof of identity can only go so far, as you are not likely to retain the document or recall much of the information in the wake of an incident. — Children must not be allowed to open the door to strangers if they are alone at home or if an adult is occupied and can’t go to the door with them. — The domestic staff must be similarly instructed not to open the door for anyone except those who reside in the house without first seeking an adult household member’s consent. 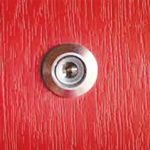 — Ask the person to hold up their ID card so you can check through the view finder (peep hole) in the door. — Have a video intercom installed, if it’s not already available, and use it to check the ID. — If you have a CCTV camera installed, have them hold it up for verification. — If you have a metal door installed on your main door to reinforce security, you can check the identity while keeping it locked. — If you are still not satisfied you can always have them slip their ID card under the door and only open once you are satisfied. The key is to make an effort to determine who is at your door and not blindly open it. If your vision is obstructed, either deliberately or accidentally, ask the person to move aside so you can identify them. If they don’t, then do not open the door. If there’s someone accompanying them or standing nearby who you aren’t sure about then don’t open. It is important to remember that if you are in doubt, deny them entry. If you have a means of checking with someone then do so, e.g. someone has come to deliver something on behalf of another family member from that individual’s office but they didn’t tell you then call that person and check. If your regular cable guy has not shown up, call their office and ask who they sent. Remember, don’t share that person’s name and ask have you sent Mr X. Let them inform you who is at your door. If you are in doubt, have them call that person on their mobile phone without letting the individual standing there know that they are calling them. Always inform every member of the household if you are expecting someone that day or in the week to come. Clearly tell them the purpose, such as a home delivery for goods purchased online, the cable TV repair, the telephone service, etc. This is particularly important if these aren’t regulars, many service providers have dedicated resources for certain areas, while they may not have visited you earlier, you may recognise them from coming to a neighbour’s house. What to do in emergency, if alone? In an emergency such as a gas leak, burst water pipeline, an electrical short-circuit, etc. you will most likely have multiple persons respond to the call for help. If you are alone, then don’t permit more than one person inside. If you are a woman and alone at home then you have to be more cautious and call upon an adult neighbour to be present with you while the workers are there. Alternatively you can ask the neighbours’ domestic staff to support you. The element to consider is that you have someone you can trust to be present to help in case of any inappropriate action. When the workers are inside, never leave them unsupervised even if it’s for a moment. If you receive mail via courier regularly and reside in an apartment complex, it would be prudent to allow the building reception / guard to receive it on your behalf, unless it is a confidential package (bank statements, passports, etc.) or then something that would be ruined if left unattended for a while such as food items. In such instances, you can inform the guard / reception to send the courier directly to your home. Once again, this will alert you to any courier that comes directly to your door if you’ve not informed the reception / guard prior. If you live in a bungalow then you can consider creating a window that’s protected with a grill in the perimeter wall to allow you or your domestic staff to receive the mail without having to open the gate. Criminals who disguise themselves as service providers are counting on the person being complacent, and opening the door for them without much thought. Their rouse is based on taking you by surprise when your guard is down. Therefore, if you put in place a proper mechanism to always confirm the identity of a person at your front door you will reduce your risk significantly.